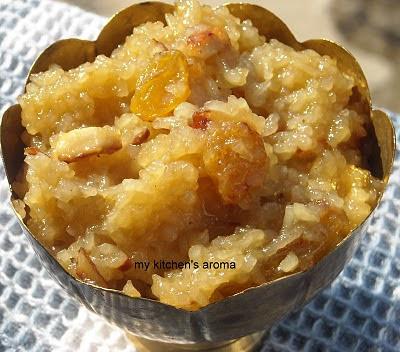 I made this pongali on the bhogi day.I love this combination of jaggery,moong dal and rice.Very easy to make and very tasty dessert. Soak moong dal for 2-3 hours. In a pan take ghee and fry cashew,raisins and badam separately.Keep aside. In a deep bottom pan take jaggery and 1/2 cup of water. Bring it to boil.Then add the cooked rice and dal. Mix throughly and add the cashew,elachi,raisins and badam. The left over ghee after frying the dry fruits can also be added to the pongali. Let all the water dries up and jaggery is thoroughly mixed with the rice.Then switch of the stove. Delicious and droolworthy sakkarai pongal..
Pongal looks so mouthwatering. Already drooling. This pongal is been tempting for the past two weeks in all the blogs, I have to try this. Sweet Pongal is looking yum and mouth watering.